Nearly 71 percent of landscape architects now rank wireless and internet connectivity as a top consumer demand, according to an American Society of Landscape Architects survey. WASHINGTON — Homeowners are embracing smart-home technology, and not just inside anymore. The D.C.-based American Society of Landscape Architects surveys its members every year about trends, and for the first time, technology has cracked the top 10. Its 2017 survey says nearly 71 percent of landscape architects now rank wireless and internet connectivity as a top consumer demand. “We are definitely putting in GFIs (ground fault interrupter outlets — required by code for outdoor use) wherever we can because people are constantly charging their phones and iPads and their wireless speakers, but more specifically tech friendly, we are getting much more involved with hooking up the irrigation systems, outdoor lighting systems and outdoor sound systems to your phones,” Jennifer Horn at Jennifer Horn Landscape Architecture in Arlington tells WTOP. “We’ve been wiring landscapes with outdoor speakers for a long time, but now the fact that you can control that from your phone is much more convenient and people are using it more because it’s a lot easier to turn on and of your music and hook it up to your Spotify account or Echo account now than it would have been five years ago,” she says. Horn says homeowners want to spend more time outside and are looking for ways to stretch the season. Other popular requests include outdoor fireplaces, radiant heaters and outdoor kitchens. And homeowners are more savvy about the environment, with popular requests including things like permeable paving, drip and water-efficient irrigation and rainwater harvesting. What people want less of are lawns. “I always encourage people not to be hung up on the idea of a perfectly manicured turf lawn. They’re not at all sustainable because they require a lot of attention, a lot of man hours, and of course fertilizers and weed control,” Horn says. 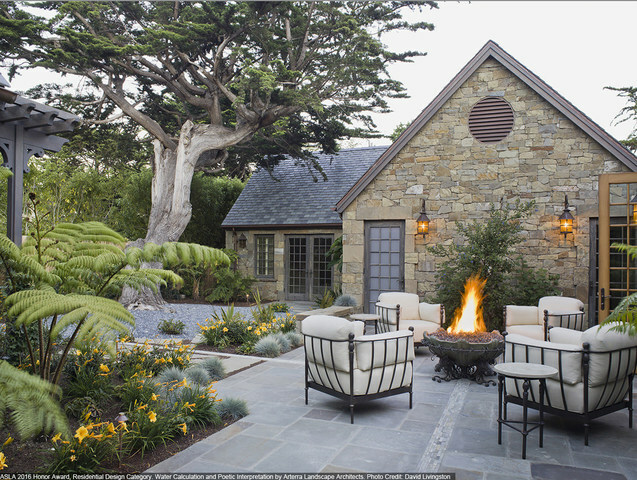 The top three most popular outdoor design elements in this year’s landscaper survey are fire pits and fireplaces, wireless and internet connectivity and landscape lighting. The top landscape and garden elements now include native plants, low-maintenance landscapes and vegetable gardens.